I think I've gone Halloween crazy. There was a time when I had very little in the way of Halloween decor. Of course that was before blogging! with the window, I struggled to put anything up against it. I've had this pumpkin box for a few years now. and gave it a sparkly spider. Black & white plate, most likely from TJ Maxx. in Gettysburg, PA some years ago. from a booth at an antique shop. that I've had for years. I added another cake plate & a wire cloche. And there I go, playing in PicMonkey again! What an obsession, I tell ya! Gina, so cute! I love everything! Happy Halloween! It all looks great! Adorable vignette! I love that wire cloche! Hope all is well where you are. Take care! So cute Gina! I don't think we'll be trick or treating here this year, thanks to "Sandy"! 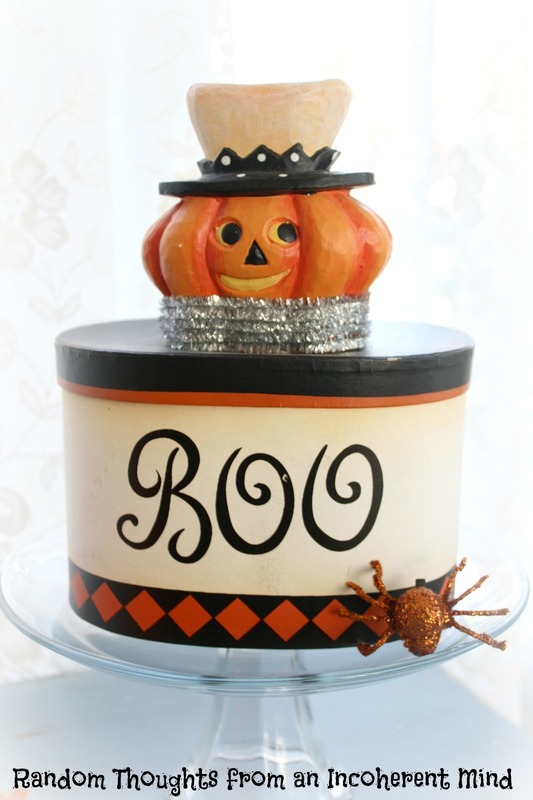 your Halloween decor is so sweet! 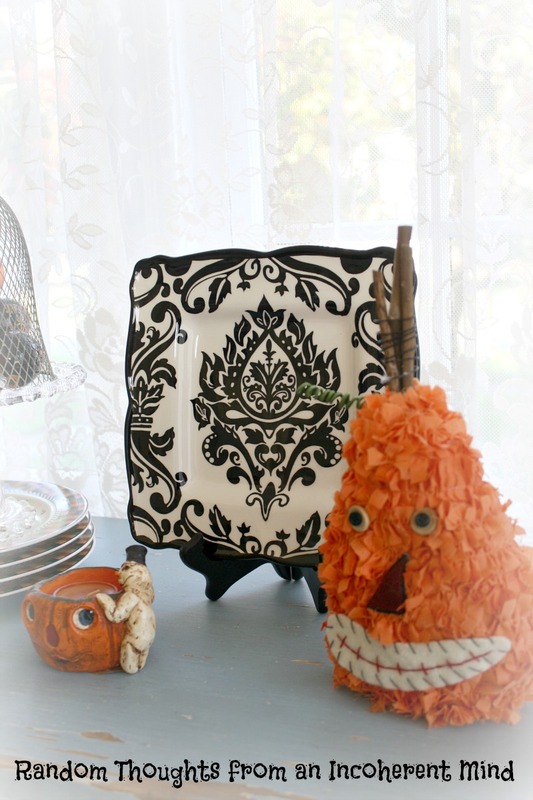 Love the pumpkin box and the stuffed pumpkin! To cute! Actually, I like it all! Thanks for visiting, I enjoyed browsing thru and I'm your newest follower. Love your festive and fun mood for Halloween, Gina! TOO CUTE!!!! You have mastered PicMonkey, Gina! 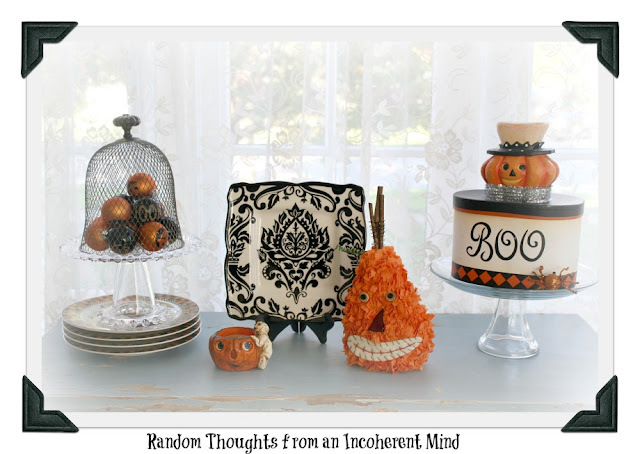 I love your little pumpkin head box vignette! I hope that you are all snug and safe with all the bad weather happening around you! Happy Halloween to you and all of your precious pumpkin heads! I barely just decorated ( just a tiny bit) yesterday for Halloween. 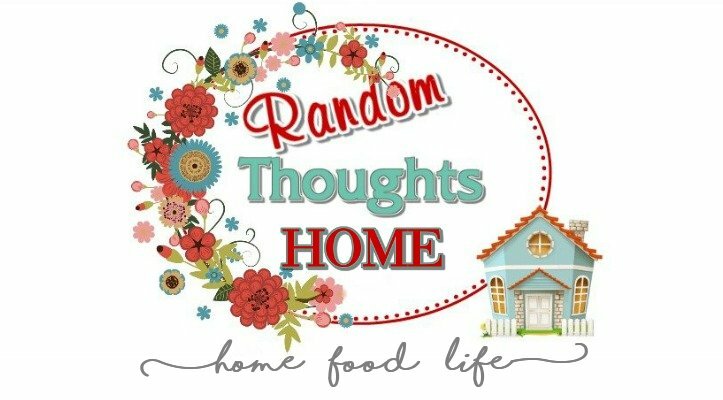 I know I'm running late but considering I was thinking of not doing it at all...Always make our little cottage feel a bit more fun so I had to do it :-) Your vignettes are super sweet. Tomorrow is the big day. Yay! Happy Halloween. Nice! 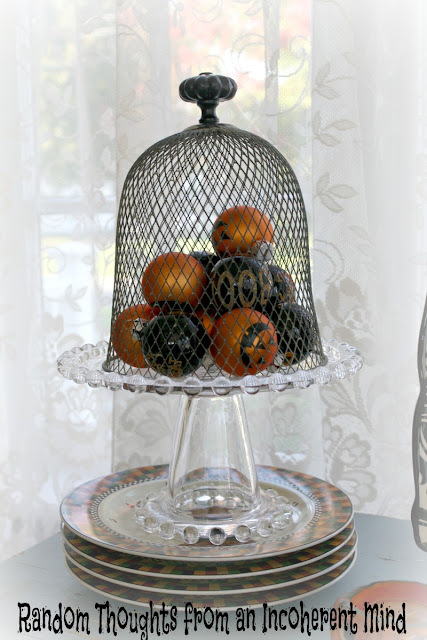 I like the black and white plate and the wire cloche, so versatile. you always do such a great job decorating! Thanks for sharing your cute decor with us. I think that is better than just being plain old regular crazy. You are such a great decorator, Gina..every thing you do looks sooo good. Gina, I love your take on Halloween. I'm really not a fan of all the gore. I love your happy upscale design! Gina you have the cutest Halloween decor. Your vignettes are really gorgeous too. I hope everything is well in your area. Cute vignette on the blue dresser. I know about blogging. I have many more seasonal tubs now than I did before blogging. 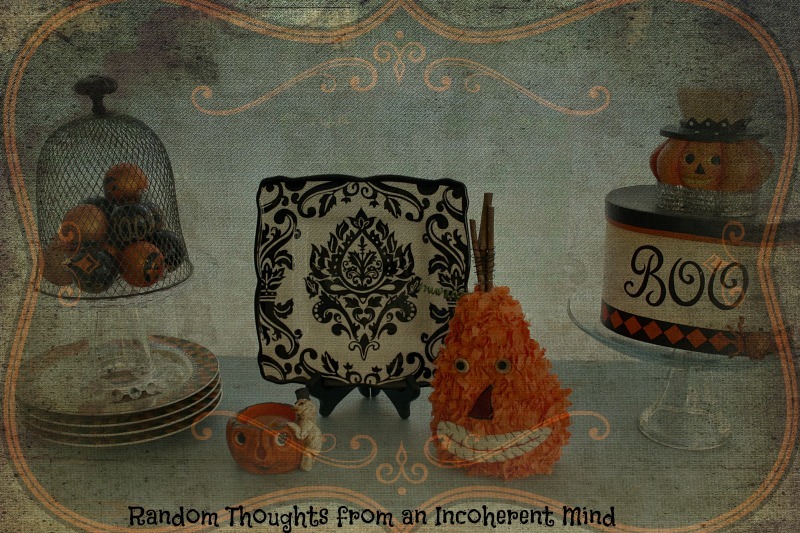 Gina you have the best vignettes:) Love it! Happy Halloween! Beautiful Gina! I love PicMonkey...how did you get the effects of the last picture? 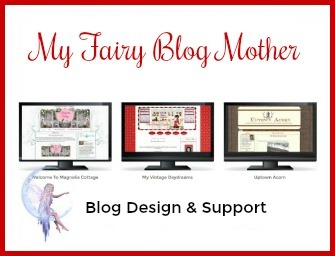 Are you a paying PicMonkey member or is this one of the freebies? Great vignette! I especially love the Halloween ornaments under the wire cloche on the glass cake plate. We never get any kids at Halloween since we have no street lights and live way up a hill....but what a treat it would be to drop by your house at Halloween... so much fun. Cute, cute and more cute!!!!! Ready to move to the next holiday? Love your last post on the candy buffet--what fun. Gina how cute... Now how did you and your family fair through this whole Sandy mess? Hope your Halloween was happy (: I love the vintage vibe of your stuff G.
It poured here. No trick or treaters. Off to bed. Happy weekend!! Hey thanks for stopping by! I love the wire cloche! I need to start a new collection! lol! Love, love your square plate! Gina, I love your Halloween window vignette. It all looks so happy and fun. I can't wait to see what you put up next. Gina, what a cute display! Love the pumpkin box! The plate is gorgeous! Love how it can be dressed up or down. I have always had WAY too many Halloween decorations. Try to get rid of a few each year. But then, I always have to add a few new ones. lol! I love picmonkey too! Just so fun. Oh so cute Gina, I am a little late, i guess you will be adding a few turkeys soon!